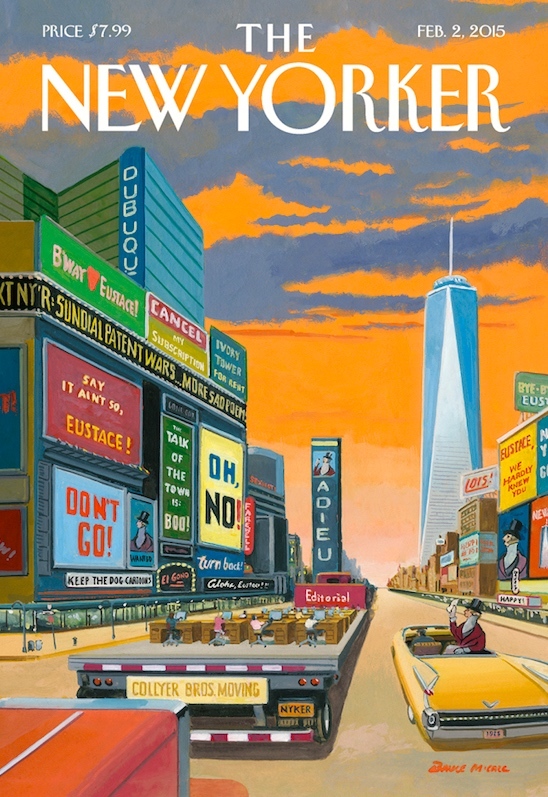 “Last week, the staff of The New Yorker made its final preparations to leave 4 Times Square, its headquarters for the past fifteen years, to join the rest of Condé Nast, the parent company, down at 1 World Trade Center, the new megatower in lower Manhattan,” writes Nick Paumgarten in a Comment titled “Here.” The artist Bruce McCall pictures what it felt like to pack boxes while we were finishing the last issue in our old building. A note on McCall, then some details from the cover. A fandango once attributed to Soler, and probably more often performed than any other work of his, is now thought by some to be of doubtful authorship. and was reminded how much I enjoy the word fandango — a straightforward case of “word attraction” (the opposite of word rage). So I’ve gone on to play with the word. That’s obviously no groundhog, but some kind of crocodile, so the strip works at one level. But that’s not just any crocodile; it’s one of the crocodiles from Stephan Pastis’s comic strip Pearls Before Swine. What makes this especially entertaining is that Pearls itself is exceptionally rich in cross-comic allusions. I very much doubt that I knew the word comfit when I was 6. There are 14 other salt mines in the United States, but none of which are accessible to tourists. Both are syntactically unproblematic (disregarding the disputed usage choice between none … are and none … is, which is identical for (a) and (b)). But it appears that the writer(s) began option (b), with the conjunction but, and then continued with the relative-clause syntax of option (a). A classic syntactic blend, it seems to me. Hutchinson, Goodland, Cawker City, Lawrence, Wichita. You are currently browsing the Arnold Zwicky's Blog blog archives for January, 2015.